The goal of SquareChaser is simple, make all the squares show the same color, pattern, or shape. Tap on a square to change it to the next color, pattern, or picture. The color changes happen in a regular pattern. Your score increases each round by the amount of seconds you have left. You have a limited number of seconds to compete a round. Higher rounds have more time to work with. As you progress, there are more and more squares to deal with. As you progress, there are more and more steps in the color change sequence. Sometimes the colors or patterns look very very similar, you have to rapidly decide what matches. Color change patterns get longer, starting at 3 and going as high as 18 steps. And even worse, while you're trying to get them to match, there is an evil Imp trying to thwart you! The Imp is constantly changing the position and colors of squares . So just when you think you're almost done, a square will move or it's color will change. Try to get done as quickly as possible. Your score on each round is based on how fast you complete the round. And if you don't finish a round in the allotted time the game is over. - If you find a pattern too hard to distinguish from another, try rotating your device. Moving from Portrait to Landscape re-arranges the squares, and you might find the pattern s easier to recognize in the new orientation. - Hit the "Info" button and turn on index numbers. This will put the number in the sequence that square is on in the middle of the square, so all you'll need to do is match numbers. Warning! Your score for rounds you have index numbers turned on will be cut in half! Use index numbers as a last-ditch emergency measure. - Shake your iPhone or iPod touch and you'll be asked if you want to skip the current round. If you skip the round you will lose 100 points, but at least you can move on. ZoneVsZone is a handy way to visualize 24 hours of time in different time zones. It's usually easy to figure out what time it is right now in a different time zone, and lots of clocks do that. But it can get confusing when you're thinking 4, 6, 14 hour ahead, particularly when trying to remember if it will be AM or PM then. ZoneVsZone gives you a handy way to see a full 24 hours of one time zone against another time zone. Running your finger up and down the time list enlarges each hour making things easier to read. 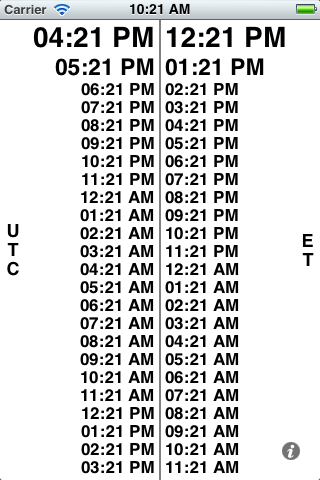 Time zones default to GMT and your local zone. Tap the Info button to get to settings, allowing you to choose the time zone for the left and right side of the clock. You can also set 12 vs. 24 hour time display. If you use ZoneVsZone a lot, please consider making a shareware contributin on the settings page. Thanks!